FEDERAL HIGH COURT ORDERS THE RE-OPENING OF ALL FROZEN COSON ACCOUNTS AS THE SUIT FILED BY PRETTY OKAFOR AND PREMIER MUSIC IS THROWN OUT. Mr. Justice Mohammed Hassan of the Federal High Court Lagos, on Wednesday, February 6, 2019 ordered the re-opening of all bank accounts of Copyright Society of Nigeria (COSON) at United Bank for Africa (UBA), Diamond Bank PLC and First Bank of Nigeria, frozen as a result of an interim order issued by him on November 30, 2018. The judge also struck out Suit No. FHC/L/CS/1819/2018 brought by Premier Music Publishing Ltd, Pretty Okafor and one other saying that his court lacked jurisdiction to hear the suit as there was a subsisting order of the Federal High Court on the matter. 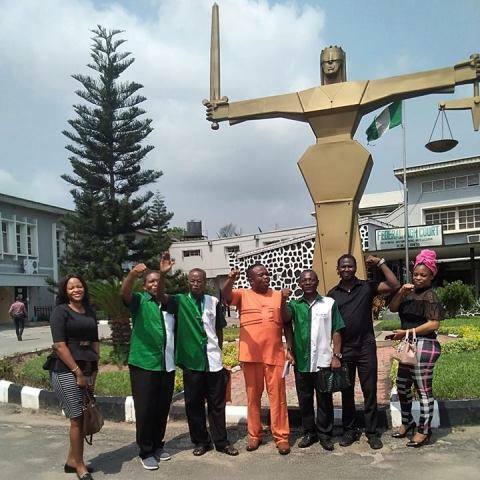 On December 17 when the application to have the order of Justice Hassan vacated, was moved by COSON lawyer, Mr. Uche Val Obi SAN, the senior advocate drew the attention of the court to the fact that Pretty Okafor, one of the plaintiffs who deposed to the affidavit upon which the ex-parte order was obtained, did not disclose to the court that while he was a member of a defunct musical group called “Junior & Pretty”, he had never at any time applied to be a member of COSON, never been granted membership of COSON, does not possess a membership number, membership certificate or membership card of COSON, has not assigned any copyright to COSON and has no voting rights in any meeting of COSON and no interest in the funds of COSON. The senior advocate also drew the attention of the court to the fact that Mr. Okafor did not disclose the existence of Suit No ID/ADR/903/18 filed on the 22nd of May, 2018 against him by the Chairman of the Board of COSON, Chief Tony Okoroji in which Chief Okoroji is claiming the sum of six hundred million naira for malicious lies and serial defamation published by Mr. Okafor, a suit to which Mr. Pretty Okafor had not filed any defence. Mr. Obi went ahead to remind the court that COSON has well over 4,000 members across the country made up of Nigeria’s foremost songwriters and performers who have interest in the funds of the society and who had not authorized the Plaintiffs whom he described as forming less than 0.075% of the COSON membership to bring the court action and that none of the over 150 reciprocal representation partners of COSON across the world was in support of the suit and that the plaintiffs lacked locus to bring the action. The court was also told that the Extra-Ordinary General Meeting of COSON had been fixed and widely publicized to hold on December 18, 2018 and that the injunction was a devious plan by the plaintiffs to starve COSON of funds, abort the extra-ordinary general meeting and deny the thousands of innocent COSON members their earned royalties planned to be made available to them at the EGM. In the affidavit in support of the application, it was deposed to that Mr. Toju Ejueyitchie, the Managing Director of Premier Music, the 1st Plaintiff in the case, was a member of the Management Board of COSON and failed in his attempt to be re-elected to the Board and has since then been antagonistic to COSON and has repeatedly written petitions upon petitions against COSON and despite the fact that an overwhelming majority of the members of COSON resent their plans and strategies, the plaintiffs have become obsessed with their desire to control COSON. The attention of the court was drawn to the fact that COSON was practically unknown and given little chance of survival about eight years ago but as a result of focused and dedicated leadership, the organization has grown in leaps and bounds, attracting the bitterness and acquisitiveness of some like the plaintiffs who have relentlessly attacked and distorted the records of the organization with every instrument they can muster. The court was also told that as proof of the malice behind the action of the plaintiffs, immediately after obtaining the injunction, they rushed to the banks and ensured the service of the order on all the banks but made sure that COSON was not served. COSON only discovered that all its bank accounts had suddenly and mysteriously been shut down and every road block set up to prevent it from processing and filing a proper application to discharge the order. Several members of the COSON Board as well as the COSON General Counsel were in court when the decision was read. Reacting to the court decision, COSON Chairman, Chief Tony Okoroji who was in court when Justice Hassan read his detailed ruling said that he was happy with the judge’s understanding of the issues. He said that he was touched by the calmness with which the members of COSON had endured the trauma they had been forced to go through and said that every step would be taken to ensure that all outstanding royalties are sent to their rightful owners without delay. The Plaintiffs were represented in the case by Dr. Adewale Olawoyin SAN.